The phrase evidence-based medicine (EBM) was coined by Gordon Guyatt1 and then appeared in an article in The Rational Clinical Examination series in JAMA in 1992,2 but the roots of EBM go much further back. The personal stories of the origins of EBM were recently explored in a filmed oral history of some of the individuals most strongly associated with the birth of the movement (see Video, Evidence-Based Medicine: An Oral History). JAMA and the BMJ invited 6 individuals (including us, with one of us as host, R.S.) who have played a prominent part in the development of EBM to participate in an oral history event and filming. Videos of this event and of interviews with 3 other EBM leaders (Box) have been woven together and may be accessed at http://ebm.jamanetwork.com. Just 20 years after the term EBM began to be used, an early and informal history has emerged. Three individuals from an earlier generation were particularly important in inspiring the people interviewed: Thomas C. Chalmers, Alvan R. Feinstein, and Archibald Cochrane. Some of the contributions of Tom Chalmers, who died in 1995 at age 78, were recently described in JAMA.3 David Sackett memorializes Chalmers’ 1955 report of a randomized factorial trial of bed rest and diet for hepatitis4: “Reading this paper not only changed my treatment plan for my patient. It forever changed my attitude toward conventional wisdom, uncovered my latent iconoclasm, and inaugurated my career in what I later labeled ‘clinical epidemiology.’”5 The rigorous approach taken by Tom Chalmers toward randomized trials and his early adoption of meta-analysis were key to the development of these tools of evidence. Alvan Feinstein, a clinician and researcher at Yale who died in 2001 at age 75, was important in defining clinical epidemiology and in first showing how medical practice could be studied.6 Archie Cochrane, a clinician, epidemiologist, and professor at the Welsh National School of Medicine, who died in 1988 at age 79, published his seminal book Effectiveness and Efficiency: Random Reflections on Health Services in 1972.7 His work8 was the inspiration for the Cochrane Collaboration, which has played a central role in promoting EBM. Several of those interviewed identified when they began to be aware of the deficiencies in what might be called “expert-based medicine.” Brian Haynes, a professor of clinical epidemiology and biostatistics at McMaster University, began his journey to EBM in medical school in 1969 when he was lectured on the theories of Sigmund Freud. He asked the lecturer for the evidence that the theories were “true.” The lecturer answered candidly that he did not think that there was any evidence and that he had been sent by the chair of the department, a Freudian, to give the lecture. “I had,” says Haynes, “an intense tingle in my body as I wondered how much of my medical education was based on unproved theories” (Evidence-Based Medicine: An Oral History Video). David Sackett, former professor of medicine at McMaster University, is regarded by many as “the father of evidence-based medicine.” In the late 1960s at the age of 32, he was invited by John Evans, an internist, to join a new and different kind of medical school at McMaster. Students would learn from the problems of patients, and epidemiology and statistics would be taught together with the clinical disciplines. 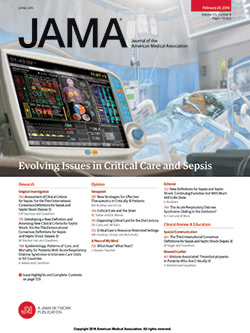 After some years of the McMaster program, Sackett and his colleagues decided that they wanted to share what they were doing and wrote a series of articles on what they called “critical appraisal,” which appeared in the Canadian Medical Association Journal in 1981.10At that time, while on sabbatical in Dublin, Sackett began to write with others Clinical Epidemiology: a Basic Science for Clinical Medicine,11 which started in 1985 as a book about the critical appraisal of research and developed in the second and third editions into a book about research methods and “the bible” of EBM. Evidence-based medicine grew out of critical appraisal. When Gordon Guyatt, currently a professor of epidemiology and biostatistics and medicine at McMaster University, took over as director of the internal medicine residency program at McMaster in 1990, he wanted to change the program so that physicians managed patients based not on what authorities told them to do but on what the evidence showed worked. He needed a name, and the first was “scientific medicine.” The faculty reacted against this name with rage, arguing that basic scientists did scientific medicine. The next name was “evidence-based medicine” (Evidence-Based Medicine: An Oral History Video). In the Oral History Video, Sackett distinguishes EBM from critical appraisal because it combines research evidence with clinical skills and patient values and preferences. He comments that clinicians have to be able to make the diagnosis and then discuss options with patients. Sackett uses the example of nonvalvular atrial fibrillation in which a patient has a small risk of a stroke. He asks and answers, “Should the patient take warfarin and so risk a bleed? Most patients see a stroke as about 4 times worse than a bleed. You combine that with number needed to treat and number needed to harm and conclude that you are about 11 times more likely to help rather than harm a patient by treating him or her with warfarin” (Evidence-Based Medicine: An Oral History Video). Guyatt acknowledges that in the 1992 JAMA article there was little about patient values.2 It was over the next 5 years that patient values and preferences became much more central, and since then strongly emphasized (Evidence-Based Medicine: An Oral History Video). Muir Gray, a public health physician and UK National Health Service manager, and Iain Chalmers were both inspired by the program at McMaster and persuaded Sackett to move to Oxford in 1994, where he worked as a clinician and was also director of the Centre for Evidence-Based Medicine. Sackett worked to spread EBM to the rest of the United Kingdom, Europe, and beyond. He visited most of the UK district general hospitals and many in Europe and would begin his visit by doing a round on patients admitted the previous night with young physicians and showing EBM in action. The young physicians realized that they could challenge their seniors in a way that was not possible with expert-based medicine. It was liberating and democratizing (Evidence-Based Medicine: An Oral History Video). Evidence-based medicine quickly became popular, Sackett believes, for 2 main reasons: it was supported by senior clinicians who were secure in their practice and happy to be challenged and it empowered young physicians—and subsequently nurses and other clinicians. Evidence-based medicine did, however, produce a backlash, particularly, says Sackett, “among middle-level guys who were used to making pronouncements,” including an unsigned, critical editorial in TheLancet in 1995 titled “Evidence-based medicine, in its place.”15 Among the many responses to that backlash was an editorial in the BMJ by Sackett and others titled “Evidence based medicine: what it is and what it isn’t.”16 That BMJ editorial, says Sackett, “turned the whole thing around.” It carefully refuted all the complaints made against EBM: it wasn’t old hat, impossible to practice, cookbook medicine, the creature of managers and purchasers, or concerned only with randomized trials (Evidence-Based Medicine: An Oral History Video). The systematic evidence of what worked in pregnancy and childbirth stimulated the thought that the same could be done for the rest of health care, and in May 1991, while walking beside a tributary of the Thames, Iain Chalmers conceived the idea of the Cochrane Centre. It began in 1992 and from the beginning was intended as an international program, which, because of the immensity of the task of reviewing and assessing the entire literature on all interventions needed to be based on the efforts of well-trained volunteers. The Cochrane Collaboration began in 1993 and has grown to include champions of EBM across the world. Evidence-Based Medicine: An Oral History is now available free for all to see and learn about the origins of this movement. The video features EBM leaders’ perspectives on the past, present, and future of EBM, along with personal reflections of clinical and patient encounters and shared decision making in the context of EBM. The video makes clear that much has been achieved, but that much remains to be done. Corresponding Author: Richard Smith, MBChB, CBE, FMedSci, FRCPE, FRCGP, UnitedHealth Chronic Disease Initiative, 35 Orlando Rd, London, UK SW4 0LD, United Kingdom (richardswsmith@yahoo.co.uk). Published Online: January 21, 2014. doi:10.1001/jama.2013.286182. Conflict of Interest Disclosures: The authors have completed and submitted the ICMJE Form for Disclosure of Potential Conflicts of Interest and none were reported. Funding for travel to participate in the Evidence-Based Medicine Oral History event and filming was provided by JAMA and the BMJ. Funding/Support: Funding for the Evidence-Based Medicine Oral History event and filming was provided by JAMA and the BMJ. Simultaneous Publication: This Editorial is also being published in the BMJ. Sackett DA. 1955 clinical trial report that changed my career. James Lind Library website. http://www.jameslindlibrary.org/illustrating/articles/a-1955-clinical-trial-report-that-changed-my-career. Accessed October 27, 2013. Cochrane AL. Effectiveness and Efficiency: Random Reflections on Health Services. London, UK: Nuffield Provincial Hospitals Trust; 1972. Cochrane AL. 1931-1971: a critical review, with particular reference to the medical profession. In: Medicines for the Year 2000. London, UK: Office of Health Economics; 1979:1-11. Chalmers I, Enkin M, Keirse MJNC. Effective Care in Pregnancy and Childbirth. Oxford, UK: Oxford University Press; 1989. Sackett DL, Haynes RB, Guyatt GH, Tugwell P. Clinical Epidemiology: A Basic Science for Clinical Medicine.2nd ed. Boston, MA: Little Brown; 1991. Simel DL, Rennie D. The Rational Clinical Examination: Evidence-Based Clinical Diagnosis. Chicago, IL: American Medical Association; 2009.